Life is full of choices, and none are as hard as choosing which toothbrush to buy. We spend over 1000 hours in our lifetime brushing our teeth, so it is important to know what to look out for when purchasing a brush. The most important factor is whether you will use the brush you choose frequently. 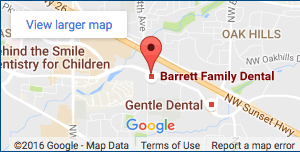 Family dentist in Beaverton, Dr. Barrett and his team at Barrett Family Dental want to make sure you have all the information to help make your smile bright and happy for years to come. Making sure you end up with a brush that has soft bristles is key when picking out your next one. Softer bristles will be kind to your gums and to your teeth surfaces. If you find yourself with bristles that are too hard, they may cause damage to your gums and even make them recede away from your teeth. This action can lay bare the tooth root and can result in sensitive teeth or damaged gums. The head of your toothbrush should effortlessly fit into you mouth and easily reach one to two teeth. This means you are probably looking for a size that is one inch long by one-half inch wide. That size, of course, changes depending on a the size of a person’s mouth and age. You also want to make sure you have a small enough brush to get to those really hard-to-reach spots in the back and corners of your mouth. Electric toothbrushes are great for some people, especially those who may need extra assistance in brushing their teeth, such as older folks with arthritis. Really though, the choice of electric versus manual is a personal one based on which one you are you going to use the most and is most comfortable for you. If you do choose an electric model, it is best to look for those with a comfortable handle that you don’t mind holding. You can talk with Dr. Barrett to see if an electric model might be a good fit for your brushing habits, and whether he recommends a version with oscillating heads. Other options like timers, how long they last on a charge and other features, are a matter of personal choice. Everyone holds their own toothbrush their own way, which makes the handle one of the other most important factors in deciding which brush to choose. When you are looking for a new brush, pretend to brush your teeth with it to see if it is comfortable in your grasp. Non-slip handle options abound and also make it easy to keep your hands where they need to be. The most important thing to remember is to replace your brush every three months or when it begins to wear out or fray. Studies have proven that a new toothbrush can eliminate thirty percent more plaque than a well-used one. Also, keep an eye out for the American Dental Association seal of approval on brushes, which means the brush has been scientifically proven to be effective and safe to use. Contact Barrett Family Dental today if you have any other questions about toothbrushes, or ask Dr. Barrett or one of our team next time you visit our office.